CASETiFY Releases Slimmest and Most Protective Military Grade iPhone Case for iPhone XS, iPhone XS Max, iPhone XR. As Apple announces three new iPhone models, CASETiFY launches the slimmest, most protective engineered iPhone cases, compatible with iPhone XS, XS Max & XR. CASETiFY is the world's 3rd largest (2nd in U.S.) tech accessories brand, and the most followed tech accessory brand on social media. CASETiFY's trademarked shock absorbing QiTech™ material is 2m drop protection proven -- making the new line of Impact Cases 2x the military grade standard. Known for innovation and originality in the tech space, CASETiFY's all new designs are fully customisable -- in a range of fonts, colours and designs using personal photos, stickers, and letters. Alongside the release of the new flagship impact cases, CASETiFY unveils a complete rebrand, including updated logo and website redesign. Available in signature designs including best-selling floral, marble, quotes and custom art collections, along with the personalised glitter and leather cases -- the all-new Impact Cases provide the ultimate 'Real Cute, Real Tough' protection across all the new iPhone devices. With the raised bezel for top to bottom screen protection and minimal profiling to avoid bulk, CASETiFY creates the slimmest (2.8mm) cases available. "In the tech accessories industry, protective phone cases still lack variety, while the fashion cases sacrifice protection. Our best-selling, drop-tested Impact Cases are the ultimate answer to what customers have been asking for," said Wes Ng, CEO and Co-Founder of CASETiFY. "In addition to being a canvas for creativity where our customers can choose from thousands of designs to express their style -- or customise their own -- they are the slimmest, most protective phone cases on the market." The new protective iPhone cases are available for shipping before the new iPhone release. Impact iPhone XS cases and Impact iPhone XS Max cases retail for GBP39. Impact iPhone XR cases retail for GBP45, available at Casetify.com. Seven years ago, CASETiFY saw a category that had been long ignored. 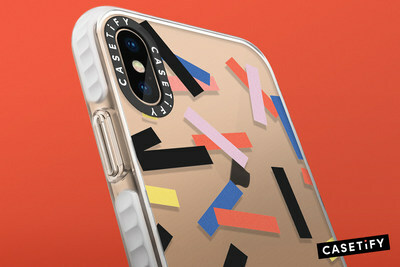 Today, reaching 1 in 7 millennials, CASETiFY has become the publisher and platform for creativity and self-expression through offering quality device cases. Brand collaborations include Pharrell, Sarah Jessica Parker, Saint Laurent, Thom Browne, and many more. Additionally, CASETiFY has partnered with key retail partners including Nordstrom, Anthropologie, Amazon, Colette, Lane Crawford, and more. For more information, please contact: zoja@whitehair.co.